Karfi. S. Wallace (BSA/Reading) directed excavations at the mountaintop settlement (ca. 1200−1000 BC) and MM peak sanctuary of Karfi first excavated by J. Pendlebury in 1937− 1939. The aim was to investigate the distribution of the settlement over the 3 peaks of Karfi, Mikri Koprana and Megali Koprana, clarify the chronology of this occupation, identify and characterize earlier phases of site use and explore the potential for further research. Four trenches were opened in different areas of the site (Fig. 1), together covering ca. 124m2 and each investigating specific questions. In area A, E of the ridge linking the settlement zone excavated in the 1930s with the large unexcavated area on Megali Koprana 300m to its S, a massively-constructed, large and isolated, surface-visible building with a ‘Mycenaeanizing’ plan (A1) suggested a temple or other public building of LMIIIC date. This supposition was supported by some details of construction and the artefact record recovered: the latter includes a surface figurine, fragments of clay stands, large quantities of finewares and at least one giant pithos. Since the previously excavated sector of Karfi had its own public temple, building A1 (if a temple) might represent an institution founded by a community sub-sector with a distinct, separate identity, located in area MG, or a sanctuary serving several sub-communities within the town. Evidence for such a level of political and social complexity is lacking in any of the (mostly smaller) 12th Ct settlements systematically investigated in Crete. On the summit of Megali Koprana (area MG) a very dense and extensive area of LMIIIC architecture forms a separate well-defined sector of probably ca. 1ha within the town. It was investigated through the excavation in its N part of a LMIIIC building complex of at least 3 rooms (2 very sizeable and one with a central hearth) which had been destroyed by fire. This ensured excellent preservation of artefacts and organic remains including large burnt beams lying at floor level. The trench also produced the only exterior deposit so far recorded on the site, immediately to the E of MG1. This seems to comprise refuse layers, characterized by a high density and variety of animal bone, and will be extremely useful in characterizing subsistence at this upland site. In area B, a house of LMIIIC date (B1) was investigated immediately adjacent to Pendlebury’s excavation, in order to document a representative stratigraphy for the previously excavated zone. Two N-S orientated rooms of a structure including at least 3 rooms were half-sectioned, allowing significant enhancement of understanding of the site through the first proper recording of a hearth and a corner work platform/stand in the E room and of a very wide range of LMIIIC vessel types preserved as complete or almost-complete vessels. These seem to have been smashed in the burnt destruction of the building. Extensive soil sampling, systematic sampling for organic residue extraction from the full range of ceramic wares and soil micromorphology studies on and around features within the room will greatly increase our understanding of how these spaces were used. An extensive deposit of MMII date was found under the LMIIIC house. This is highly significant in relation to the MM use of the Karfi peak, located ca. 150m to the W, as a peak sanctuary. The deposit as currently exposed is not definitely of ritual character (though one miniature vessel was found) and may represent ancillary activity of a kind not previously documented at any peak sanctuary. In area C, a large 2-room building of massive construction was visible on the surface at the site’s extreme E edge and close to a probable LMIIIC fortification wall. The structure was investigated to establish the date of its construction and the date of the maximal spread of the LMIIIC settlement, and to help assess the date and use of the wall. Excavation of the S room suggested the complex to be of LMIIIC date, and showed it to preserve a large number of complete ceramic vessels and 2 hearths (one roughly central, the other against the S wall). Since there was apparently no communication with the N room, the investigation may be able to elucidate the phenomenon of the one-room household in LMIIIC Crete, though interestingly the room excavated is much larger than typical one-room houses of the period, including those in the old Karfi excavated zone. The 4 building complexes seem to have somewhat different dates within the period defined by LMIIIC ceramics, and study of their artefact record will throw considerable light on the development of the town over time. Each building allows specific new interpretations to be made about the site, both in terms of its internal spatial, social and economic organization, and its wider historical context. One of the most interesting findings is that at least some parts of the site (B1, MG1) were violently destroyed by fire: most LMIIIC settlements were hitherto thought to be peacefully abandoned at the beginning of the polis-state emergence process in Crete, ca. 1000 BC. This not only makes for outstanding preservation of the archaeological remains, but potentially changes the historical understanding of the period. 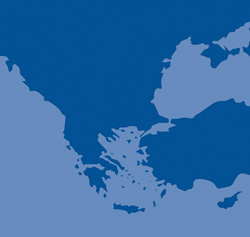 The project also includes a number of scientific studies designed to extract the maximum information from this site, and pursue research questions centred on economic adaptations in a period of major upheaval in Cretan history, here involving movement of a sizeable population to an upland environment. These include systematic sampling for wet sieving, soil micromorphology, organic residue analysis, C14 dating and charcoal identification. Fig. 1/ Fig. 1. Karfi: site map with trenches, plan of trenches A1 and C1.